CANONS PARK HISTORY - A look at the area from Roman times and before right up to the present. Activity within the land of Canons Park can be traced back to early times, as evidenced by archeological "finds" of stone-age tools. Tile making occurred within Canons Park in Roman times. This area seems to have been a production centre for official tiles for the provincial procurator’s office, based in London. Up to 26 Roman potters may have had their workshops in the area, engaged in the production of mortaria (shallow bowls with grit inside to help grind food ), flagons, amphorae, jars, lids, bowls, beakers and central heating (hypocaust) elements. The church of St. Lawrence Whitchurch has Roman tiles incorporated in the fabric of the medieval Tower and the shelters, kilns, waste dumps and clay stores associated with this industrial activity may explain some of the uneven ground in the park. In medieval times, Stanmore consisted of a substantial proportion of wood and pasture. Manor houses existed at Canons – Stanmore Chenduit, referred to once in 1260-1 and the manor of Wimborough, referred to until 1753. The land was recorded as being owned by the Augustine Canons of St Barthomolew. The stone tower of St. Lawrences Church is the obvious remaining part of the medieval Church, the old hedgerow between the Southern Parkland and Whitchurch Avenue and the Spinney woodland are likely remnants of the landscape from this period. The estate passed to Sir Hugh Losse in1544 who built a house there. The location of this house is unconfirmed. The Lake family, into which the Duke of Chandos married, owned part of the estate during Tudor times. They built a new mansion, which the first Duke of Chandos acquired in 1709. Before its purchase by the Duke of Chandos, there is no evidence of a significant designed landscape at Canons. The Duke developed the Lake’s mansion and a grand park and garden c.1720. Not long after, the house was dismantled as part of the disposal of the second Duke’s estate (c.1750). Valuable components were sold off (eg fireplaces, gates, railings) and another, more modest, mansion rebuilt on the old foundations by a successful cabinetmaker, Hallett. The new house repeatedly changed hands and the accompanying estate began to be subdivided for residential development. The North London Collegiate School purchased the house, which is now the central building of their campus. The Council purchased remaining land forming the public park we see today. Other areas became housing, sports ground and railway land. During the late 1930s, demand for recreational facilities lead to the laying out by the Council of the George V Memorial Gardens as a flower garden, within the walls of the original Kitchen Garden, to the south of the house. Even though much of the estate was lost to housing developments, many original features that structured Canons are still intact, retaining the historic framework of the Duke’s Park and linking us to the past and the people who used and enjoyed the land. Oxford Archaeology Unit (OAU) has produced an Archaeological Investigation Report, September 2003 for the London Borough of Harrow. Copies are lodged at Stanmore Library and the Civic Centre Local History Library. The report covers the Temple, which was once part of a glass Palm House, the Walled Compound -which was the Duke’s melon-ground - a medieval track across the Whitchurch Avenue, research into the Whitchurch Avenue and the Memorial Garden wall. This is the old name for the avenue in the park, mentioned in the Duke’s accounts, and not to be confused with the nearby residential road of the same name. From the south front of the house is seen the avenue which marks the road along which the Duke and Duchess proceeded to Church along a raised causeway. A semi-natural woodland strip ran parallel with the east side of the avenue. This is now called The Spinney. (Note: the name “Spinney” was originally that of woodland to the north of NLCS). This woodland strip, which flanked the north edge, is all that remains of the original Stanmore Avenue, to the west of the house – which was another carriage entrance and the main trade entrance. Also important in framing distant views of “Belmont” the part man-made hill, now part of Stanmore Golf Course. A garden with a folly set in woods, used for pleasure rather than utility, gives us the name for the Pleasure Ground around the Temple. The Temple is a classical garden building built between 1800 and 1838 and altered in form over the years. It once incorporated a heated, glass Palm House. A network of paths connected the House and Temple, remnants of which can be found in the park. The Walled Compound is present on maps from 1800 and some of the walls shown in a map c.1729. The Kitchen Garden area included the Duke’s melon ground, fruit trees, vegetable plots and perhaps cloches or hothouses for pineapples and other exotic fruits.In the southern area of the Kitchen Garden is a plantation of trees known as The Hawthorn Orchard. The area seems to have been developed in the early 1900’s and the existing hawthorns are thought to have been planted c.1950. The Memorial Garden walls are certainly at least in part as old as those of the Walled Compound.The terracing, shelter, pool, gates and planting were probably added in 1937. The landform detectable on the north boundary of the Hawthorn Orchard is probably associated with the original boundary of the Kitchen Garden. Now Canons Drive, a residential road with wide grass verges and avenue trees. The white- painted, rendered brick gateposts at the Edgware Road junction are those erected by the Duke in the 1700’s. Beneath the render is high quality brickwork discovered during restoration work c.2000. The Canons Park Estate Limited has photographs of the works including the exposed brickwork. An area of woodland and grass with a stream. Also known as the NE fragment part of the original parkland owned by the Duke of Chandos. Possible estate wall features in the woodland have been identified to English Heritage. In the grounds of the North London Collegiate School lies the altered remains of the Dukes formal pleasure gardens which therefore have a historic relationship with Canons Park. Originally the Duke’s gardens included two stone paved gardens with lily ponds and fountains to the east of the palace. South of the palace lay a grand terrace walk down to a parterre, where a formal garden was laid out in symmetrical patterns. To the south east, fronting a canal, was a gladiator sculpture, probably gilded. A flight of steps that lead to the parterre was marked by a double row of leaden urns. These extended as far as the reflecting canal. Beyond the canal and parterres lay the equally extensive ‘wilderness’ gardens, of clipped ornamental trees and shrubs. A sundial was believed to occupy the centre of the south-east Alcove wilderness, and a latticed wooden seat, the centre of a Star shaped arrangement to the north. North of the palace lay some 27 acres of gardens, divided by wrought-iron palisade railings. Here also, connected by a short alley to the palace, stood a ‘pavilion’, which was called the ‘Banqueting House’ with Corinthian columns and a dome. A twin alley led to the Physic garden farther west, beyond which were the vegetable gardens and orchards. The grounds were altered as the estate changed hands. The most notable changes were associated with the dismantling of the Duke’s palace, the building of the new mansion, the creation of new gardens around the house by Mallows c.1900 and ground levelling for sports fields. The school grounds can be visited by appointment through the NLCS Bursar’s office. A late medieval church partly rebuilt by the Duke of Chandos in the 18th century and used by the family at least until their private chapel was built. It retains original woodwork, and paintings of a continental Baroque style. Handel is associated with the church and is reputed to have played the church organ as well as composing several pieces for performance there. The Whitchurch Avenue causeway leads up to a point where there used to be a gate in a wall with a path up to the door into the church tower. The churchyard comprises a cemetery with tombs (including that of William Powell, the ‘harmonious blacksmith’, said to be the inspiration for Handel’s famous opera) and a variety of trees and shrubs, partly walled and partly bounded with more modern railings and fences.The Church holds open days on Sunday afternoons and the churchyard can be entered from the road. Lands surplus to that used to create the Canons Park Estate (residential housing) includes the Seven Acre Lake, the Basin lake, Canons Drive (verges), streams and other spaces/greens. These areas were once part of the Duke’s park and have a historical link to Canons Park. The Basin and Canons Drive have a physical link with the park as they are all publicly accessible. These areas are owned and managed by Canons Park Estate Limited which is run by a volunteer committee comprising Residents of the Estate. Historic lake with a woodland walk around its margin, fenced and gated with palisade security fencing. Access via Lake View and Rose Garden Close. CPEL members access only. Visitors accompanied by a CPEL member may be permitted. Openly accessible to the public from Canons Drive. Includes a seating area overlooking water. Rear area with stream outflow and electrical substation is fenced off. CPEL notice board located adjacent site. One of several ponds built by the Duke of Chandos on one of the approaches to his palace. Open access to the public means that an impression of the character of the historic park and gardens can be experienced here. Valuable components of the Duke’s house were auctioned when the estate was disposed of by the Brydges family. Some have been located and these are listed in Appendix 1. Items and links to people associated with the park or the surrounding area prior to the Duke of Chandos’ occupancy of the estate can be found in the archaeological gazetteer within the HRMP and OAU Archaeology report 2003. Eg. Roman tiles in roof fabric of St Lawrence church. Appendix 2 contains descriptions of some of the famous people associated with Canons. Many of those people can be researched via the internet. The restoration of Canons Park also included proposals for strategically located historical-information signboards in the park. Inventory of items separated or removed from Chandos estate and still in existence. Mont – hill used to be viewed down the Stanmore Avenue from the Dukes’ estate. Link to Augustinian Canons who once owned the land at Canons and from whom Canons received its name. Garricks Villa, Hendon Hall, National Gallery have all been claimed by various sources. Seems to be confused and unconfirmed. Reported as: Canons Drive Estate, Orchard Close. James Brydges (1673-1744) became first Duke of Chandos in 1719. He built his palace at Canons, decorated it lavishly, and collected fine books, exotic flora and fauna, and hired the best "concert" of his generation. Exotic birds adorned an aviary in the Park, where there were storks, flamingos, whistling ducks, ostriches, blue macaws and eagles. At one time Chandos had a tiger in the grounds. Dogs are reported as providing both beautification and security at Canons in 1731. The family mausoleum with statue of the Duke resides in St Lawrence church. James Brydges married into the Lake family who provided the connection to Canons. The Lake family owned the original house at Canons which Brydges altered and transformed into his Ducal palace. The family line was believed to have ended, however a recent contact (Stuart-Brydges) claims that they may be descendants and they are now members of the Friends of Canons Park. Cabinetmaker Hallet built the present smaller house, probably using some of the stones of Chandos’ palace in 1750. The Hallet family occupied the estate until the late 18th century. (The gardener’s cottage in NLCS contains carved stone animals that may be from the old house). Hallett could be described as the most successful cabinetmaker of the 18th- century. Indeed, during the early 1750s, he had a portrait painted of himself and his family - probably the only English cabinetmaker to do so - by Gainsborough to celebrate the acquisition of his country house. The National Gallery has a painting “Mr and Mrs Hallett The Morning Walk.” See their website nationalgallery.org.uk (Note there is a discrepancy in Hallett birth and death dates between this website and other sources). Dennis O’Kelly bought the estate c.1800. He owned a racehorse called Eclipse that had an almost freakish speed and ability, and was unbeaten in his racing. 80% of modern thoroughbred racehorses have Eclipse somewhere in their pedigrees. Eclipse made his owner one of the most famous men in England and was painted by George Stubbs and other leading artists of the day. Sir Thomas Plummer, the solicitor general, bought the estate in 1811. He may have rented it prior to this. The famous landscape designer Humphry Repton is accredited with work at Canons in 1806 or 1816 for Plummer. After the death of Sir Thomas Plummer’s son and widow, Canons was offered for sale by the grandson Hall Plummer. A German adventurer Strousberg bought the Estate but he soon sold it on to Dr. David Begg c.1860. After a period of little change to the estate, the house and some 500 acres of gardens, parkland and home farm were let to Sir Arthur du Cros in 1902, who bought the place outright in 1911. Sir Arthur, who founded the Dunlop Pneumatic Tyre Company, commissioned the celebrated Arts and Crafts architect Charles Mallows from 1905-1908, to remodel and enlarge his new acquisition. Du Cros later sold the northern part of the estate in 1911 for a golf course, and auctioned off the houses, outhouses and 150 acres in 1920. A property developer, George Cross bought 85 acres to construct the Canons Park Estate in the east. Other land was sold in the south to build Whitchurch Gardens. The House and 13 acres of land remained on offer until the governors of the North London Collegiate School purchased Canons in 1929. The school adapted the grounds to incorporate new facilities and buildings. This resulted in the loss of the site of the Duke’s north garden. The George Cross development (Canons Drive Estate) retained many mature trees as well as the two lakes. The intention being that these features would enhance the high-class housing planned for the Edgware Avenue. Rose Garden Close, off Canons Drive, may include a remnant of the Alcove Wilderness which was a garden between the Edgware Avenue and the 7 Acre Lake. The remainder of the site was acquired by Harrow Council in 1936 for use as a public open space. A portion was sold to Arnold House school of St Johns Wood for use as sports ground and pavilion. In 1718 Handel became the Duke's Chapel ­Master. He organised the Duke's orchestra for three years and wrote many pieces of music for his patron. This included the oratorio of Esther, two Chandos Te Deums, the twelve Chandos anthems, and Acis and Galatea. The sonata The Harmonious Blacksmith was by local legend inspired by the sound of William Powell, Edgware resident and blacksmith, buried at St Lawrence church. For further information on Handel contact Handel Institute, Handel House Museum and Friends of St Lawrence. b. Berlin 1667, d London 1752 German-born composer, conductor, and organist. Mainly self-taught expert in theory and history. Settled in London 1704. Played viola and harpsichord in Drury Lane orchestra. One of founders of the Academy of Ancient Music. From 1715 composed music for operas and masques at Drury Lane and Lincoln's Inn Theatre. Probably composed overture for Gay's The Beggar's Opera (1728) Wrote treatise on harmony (1730) and other theoretical books. Organist and composer to Duke of Chandos, 1715-1731. Note, The gardeners mentioned would probably be best researched at the Lindley Library of the Royal Horticultural Society. Alexander Blackwell, 18th Century garden designer worked at Canons 1738-42. Gardener in charge of the gardens at Canons 1720-24. Also associated with creation of Blenheim Palace gardens. Dr Richard Bradley. Born 1686, died 1732. Elected to the Royal Society. Authored book on gardening dedicated to the Duke of Chandos. Worked on planting at Canons. A book “The Ingenious Mr Fairchild” by M. Leapman 2000 gives a vivid account of this colourful character. Desagulier, a Hugenot and third Grand Master of the Freemasons, held numerous patents and was awarded at the age of 60 the Copley Gold Medal for his continuing experiments on bridge construction, steam control and water supplies. He was Chaplain to the Duke of Chandos and demonstrated his scientific findings before George II. He worked with Chandos on the water features at Canons. Grinling Gibbons is attributed with the stone carving in the Duke’s mausoleum at St Lawrence’s church. A Master Wood Carver, born Rotterdam, 1648 Grinling Gibbons came to Britain around 1670 and obtained commissions from Charles II, William III and George I. Wren commissioned Gibbons to supply decorative carving for many of his country house commissions. Gibbons' trademark was the cascade of fruit, leaves, flowers, foliage, fish, and birds. Such cascades could be applied to panelling, furniture, walls, or even chimneys. Very often objects in the carving would have a meaning or reference to a classical Greek or Roman ideal or story. Architect, born Aberdeen 1682-1754, studied architecture in Holland, notably worked on St Martin’s in the Fields, London and the Radcliffe Library at Oxford. Associated with the design of the Duke’s palace and St.Lawrence Church taking over from John James working from 1716 to 1719. Born 1672. Died 1746. Architect associated with Duke’s Palace after Talman was dismissed. Born 1674, died 1748. Notably worked for Lord Burlington of Chiswick House significance. William Kent is famous as the father of the "picturesque", or English landscape garden. Kent envisioned the landscape as a classical painting, carefully arranged to maximize effects of light, shape, and colour. He was not above planting dead stumps to create the mood he required. His gardens were dotted with classical temples replete with philosophical associations, a fact which would have been readily apparent to his patrons. Kent's most important gardening creations were at Stowe, Rousham, and Chiswick House. He may have been at a stage too early in his career to have significantly contributed to the development of Canons. Although the usual date in which Kent is thought to have started designing gardens is about c1726 (Stowe and Chiswick), Canons may signal his involvement at an earlier time. Part of the argument that Kent did indeed work on the layout of the grounds at Canons is gleaned from comparison with subsequent examples of his work elsewhere. A cross comparison between his famous works and his likely involvement at Canons is reported in Appendix 7 of HRMP. At Canons he is named as the interior decorator and he painted at least three ceilings in the palace. B 1691 d. 1781. Head gardener at Canons 1724. Gardener, nurseryman. Worked for Lord Burlington after Chandos. For more information see a book by Blanche Henrey “No Ordinary Gardener. Thomas Knowlton, 1691-1781.” Edited by A. O. Chater. London: British Museum, 1986. 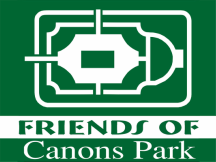 A descendant resident in the USA is a member of the Friends of Canons Park. The designs for the formal parterre and wilderness gardens around the House in the school grounds, conform to the traditional layouts of George London. Canons may have been his great, last masterwork. George London is described as one of the last great formalists and he played a leading part in creating many of the famous gardens of the period including Castle Howard, and Chatsworth. London was trained under Charles II’s principal gardener, John Rose and was sent to France to learn the art of formal planting. He was famous for his use of avenues running axially away from the house, which were bisected by rond-points and formal canals. At Wanstead he designed a forest garden similar to that proposed at Canons and was renowned for his use of the parterre. However, London died in 1714 and the design of Canons was still very much in its infancy. Whether the final layout can be attributed to London or to the other individuals known to have worked on the project is still open to speculation. Louis Laguerre (b Paris, 1663; d London, 20 April 1721). French painter, active in England. His father, a Catalan, was Keeper of Louis XIV’s menagerie, and the King was his godfather. Laguerre went to England, where he worked first as an assistant to Antonio Verrio and then became a master decorator in his own right. His first major independent commission was for William Cavendish, 1st Duke of Devonshire, at Chatsworth, Derbys 1689 to 1697 where Laguerre painted a rich trompe-l’oeil framework of mythological scenes. Associated with interiors of the Dukes Palace and of St.Lawrence Church. Presumably this group designed the King George V Memorial Garden and the Donnefield Avenue and Whitchurch Lane entrances. The only records found during a recent search were photographs of recently completed rest garden at the Whitchurch Lane entrance. The architect Charles Mallows brought contemporary style to the gardens of Canons Estate in the early twentieth century. Although his design for the north and south pool gardens are supposed to have been attempted restorations of Chandos’ layout, there are no detailed plans of the original to confirm this. Like Kent and Repton before him, Mallows was at the forefront of the design movement of the times, namely Arts and Crafts. Mallows adopted this planting style in his implementation of ‘garden rooms’, which, as a trained architect, drew on his ultimate respect for the building. Appropriately for Canons, the style was broadly revivalist with an affinity towards vernacular architecture. Mallows own terminology described his work as ‘Architectural Gardening’. Typical Mallows ‘open air rooms’ contained pergolas, rose gardens, cloister courts, lily pools, terraces and orchards, all elements visible at Canons in the grounds of NLCS. The significance of Mallows for Canons Park lies in the style of the King George V garden that reflects the style of detailing used by Mallows. Thomas Mawson, another forerunner of the Arts and Crafts, and first President of the Institute of Landscape Architects is also said to have worked at Canons, summarised the approach as ‘revivalist designs combined with modern horticulture’. There is no evidence quoted for his involvement but it is possible as Mallows and Mawson used similar design style and worked closely with each other. Builder/decorator associated with the Duke’s buildings. Giovanni Bagutti was an interior decorator of the time associated with Great Witley, Worcestershire where the chapel from Canons was rebuilt. Bagutti decorated St Martin-in-the-Fields, London and worked on Orleans House, Twickenham with James Gibbs. HRMP refers to a Pargotti, no further information found possibly a confusion.
? – 1736. Architect. Worked at Canons after James Gibbs departure 1720-21. Born 1752 died 1818. Humphrey Repton is credited with coining the term "landscape garden" to describe the natural style of gardening which he felt required "the united powers of the landscape painter and the practical gardener." He produced several articles on gardening for the Linnean Society, and 5 books on gardening philosophy and practice, including Sketches and Hints on Landscape Gardening (1794). In general, Repton’s landscape principles followed closely those of his predecessor Capability Brown “That the park should seemingly be one and the same with the surrounding countryside.” Later he adopted an element of formality in the immediate environs of the house, using terraces with balustrades and steps. Repton worked with Plummer on alterations to the estate. Frequently very little change was made to existing parks that he worked on and at one point he was putting forward reasons for the retention of seventeenth and eighteenth century avenues. However at Canons the area now known as the Pleasure Grounds to the south west of the house, were previously kitchen gardens. Repton’s possible design greatly altered the existing layout, creating lawns broken up by ornamental tree and shrubs beds. ?-1747. Architect. Supervised completion of Canons 1723-5. 1676-1741. Master-mason. Built north front of Canons in 1715. William Talman Nationality: English, Birth Date: 1650, Death Date: 1719. Leading architect of the 1680s and 1690s, Comptroller of the Royal Works. Associated with commencement of design of Duke’s palace. Sir James Thornhill (b 1675; d 1734). English painter. The great English exponent of Baroque decorative painting, he was the only one to compete successfully with foreigners for the relatively few large-scale decorative commissions available in England during the first quarter of the 18th century. Thornhill painted the interior of the dome of St Paul's Cathedral and the ceiling of the Great Hall in Blenheim Palace. Associated with Duke’s buildings at Canons. b1664 d1726 English playwright and English Baroque architect also involved with garden design. In 1699 John Vanbrugh worked with Nicholas Hawksmoor. Worked on the design of Castle Howard and Blenheim Palace. He worked with Bridgeman at Stowe and Claremont. He was consulted on the design of the Duke’s palace. London at the time of the Duke of Chandos at Canons in the 18th Century was a city where Gentlemen (such as the Duke, Alexander Pope, Hogarth and their cliques) engaged themselves in learning, Science, Art, and matters of taste. This activity was often focussed around the coffee houses of central London and The Royal Society. It is possible to imagine the discussion surrounding the horticultural experiments (eg with pineapples) and the design of a great garden taking place. Pope, Alexander, 1688–1744, English satirist. He wrote lines referring to the Duke’s flamboyant gardens and the royal state in which he lived which was regarded as extravagant. It was about the formal gardens at " Princely Canons " that Pope made a gibe at Canons. Novelist born London 1660 author of “Robinson Crusoe.” He also wrote books describing his travels. Daniel Defoe in his “Tour Through the Whole Island of Great Britain” (1724-6), called Canons the most magnificent mansion house in England. He described the building and the gardens, the interior, the chapel and the library. Sir Matthew Decker (1679—1749). A director of the East India Company he was created a baronet by George I. Decker had ‘a truly Dutch passion for gardening’ and a famous garden at Richmond Green. He was a friend of Brydges, and was consulted by him about Canons presumably about the gardens and horticulture. There seems little doubt that Decker, or rather his gardener Henry Telende, was the first to fruit the pineapple in Britain. 4. “A History of the County of Middlesex” p.114/115 “Little Stanmore”. 6. Scale particulars c.1887. Ref: Plan Chest Draw 7 – no plan. 7. “James Brydges First Duke of Chandos” Baker. Ref.H2 CHANDOS. 8. “Princely Chandos – James Brydges 1674-1744” Ref. H2 CHANDOS. 10. “Handel. A Documentary Biography” Ref H2 HANDEL Otto Erich Deutseh. 11a. Extracts from “George Friederic Handel: his personality and his times” Cassel 1959. 11b. Extracts from “Cannons Duke of Chandos” Dean W 1982. 13. “Excellent Cassandra. The life and times of the Duchen of Chandos.” Joan Johnson. 1981. “Stanmore Past” – The Manors of Stanmore Chapter on Cannons. Correspondence re Memorial Garden. Info file Parks – including leaflet and ticket for opening event.